I have a colony of bees that always clusters on the west side of their hive — and I don’t know why. I’ve had this colony for almost four years now (she’s an old queen that I started from a swarm cell) and I’ve noticed this clustering behaviour since day one. Even when I rearrange the frames of the brood nest in the spring so all the brood is in the middle of the hive, the brood nest eventually shifts to the west side of the hive. I’ve checked everything over the years and there’s nothing unusual about the hive set up. No signs of mice, no leaks on one side of the hive, nothing. I’ve used various hive bodies and other hive components. I even moved the hive to a different beeyard and rotated it so the cluster was on the east side. Within a month the cluster shifted to the west side. My best guess is the bees prefer the heat of the setting sun. This entry was posted in Behaviour, Brood Nest / Cluster, Month of April. Bookmark the permalink. ← Final Snowstorm of 2016? So odd. I’ve noticed the same thing in my hives. 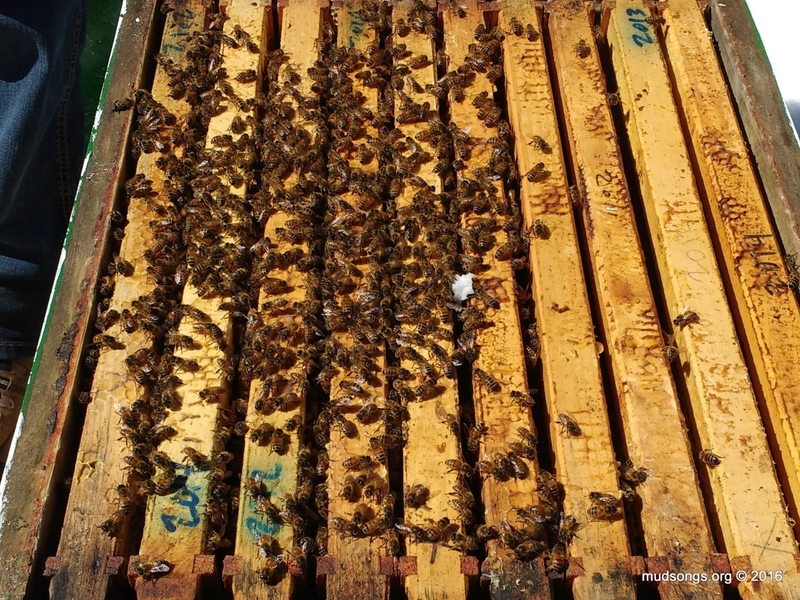 They start building comb on the west side of the hive, and the queen begins laying on that side, too. Really? I’m intrigued. I’ve only noticed it with this one colony. It may have from time to time happened in other hives over the years, but not enough for me to notice it consistently like I have with this particular colony. I’ve never read about this or heard much about it before. But it makes sense, I suppose, because the west side of the hive is likely to be warmer at the end of the day than any other side. I’ve often got a sunburn on my face from the setting sun. A cluster closer to the warm side of the hive at the end of the day might get an extra boost of heat to get them through the cold night. Maybe? In my top bar hives, the first brood coming out of winter is always on the west side of the hives due to the warmth of the low sun on that side. During the summer, I don’t notice that one side is favored over another, but maybe I’ll look a little closer this year to see if there is a noticeable difference. Our three hives have always been slightly or not-so-slightly shifted to the west as well.